Oh what fun it is to have friends who love to party! My family has been so blessed by the friendship of a wonderful husband and wife (the Langes) for about 7 years. When we met them we had no idea that friendship with Langes also means being on the invite list for several wonderful parties throughout the year. One of the yearly parties the Langes host is a huge, summer luau party. The party includes about 80 guests, a DJ, lots of yummy food, drinks from their very own slushy machine, and luau decorations galore inside and out. The party makes use of an incredibly beautiful yard that that Langes have created on their hill-side lot. 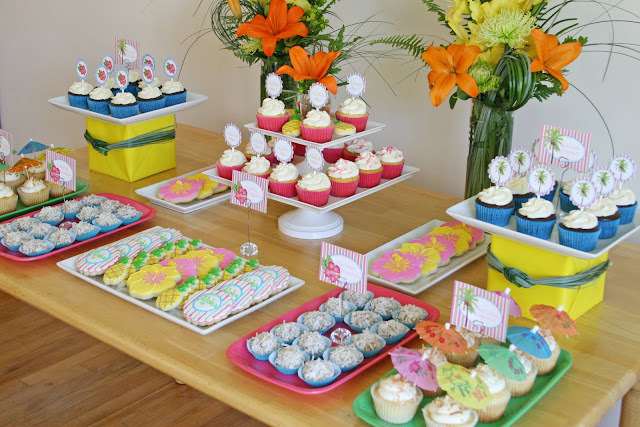 The past couple years I’ve had the joy of creating desserts for the party. Here are the desserts I made and set up for the Lange Luau 2010! Several styles of hand decorated sugar cookies (cookie recipe HERE, royal icing recipe HERE). I also made two custom flower arrangements for the display. I always enjoy any opportunity use my “old” floral design skills (I worked as a floral designer for 8 years). I contacted Littlebeane Boutique to get some custom printables for the party. I was so pleased with the beautiful food labels (in two styles) and cupcake toppers (in three styles). 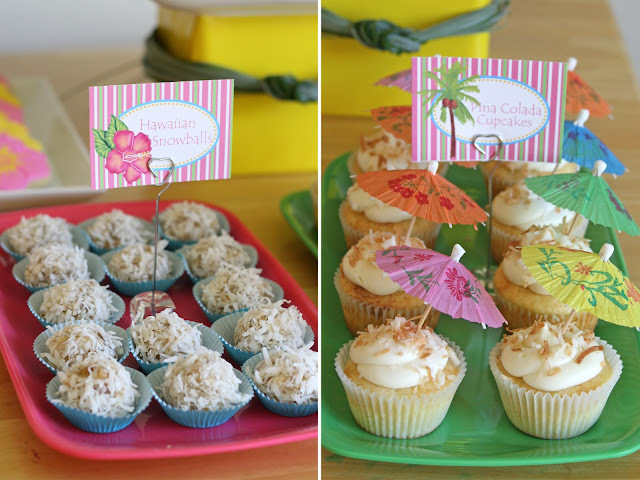 I even used the design from one of the styles of cupcake toppers (above) for my cookies (below). 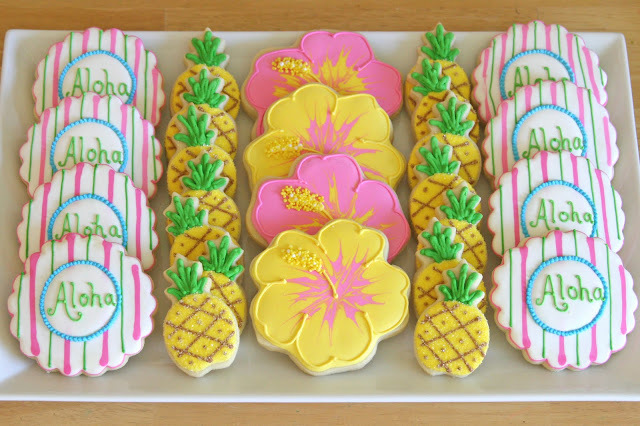 I have step by step decorating tutorials posted for the Hibiscus Cookies and Pineapple Cookies. 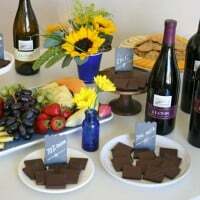 More yummy food with beautiful labels by Littlebeane Boutique. To add height to the table, I used some boxes (that I’ve used several times before) covered in wrapping paper, with plates on top. 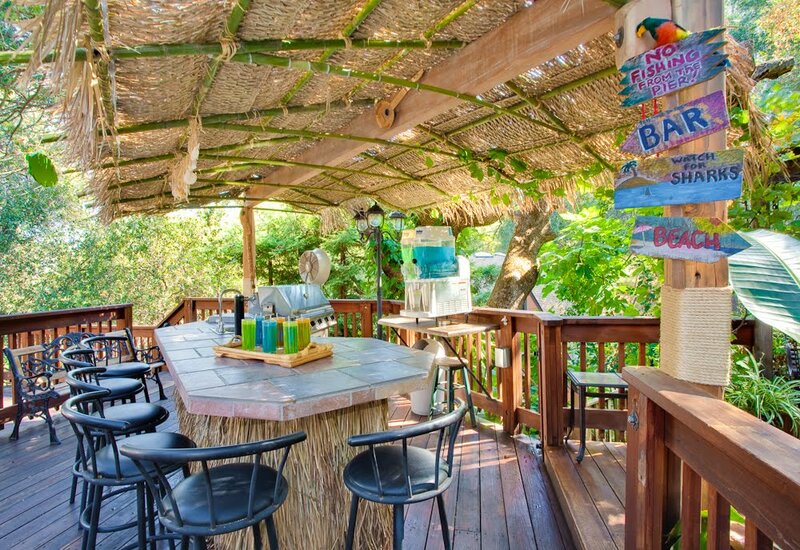 To add an additional Luau detail, I tied bear grass in a knot and wrapped in around the boxes. As I mentioned at the beginning of the post, the Langes have an incredibly gorgeous yard. 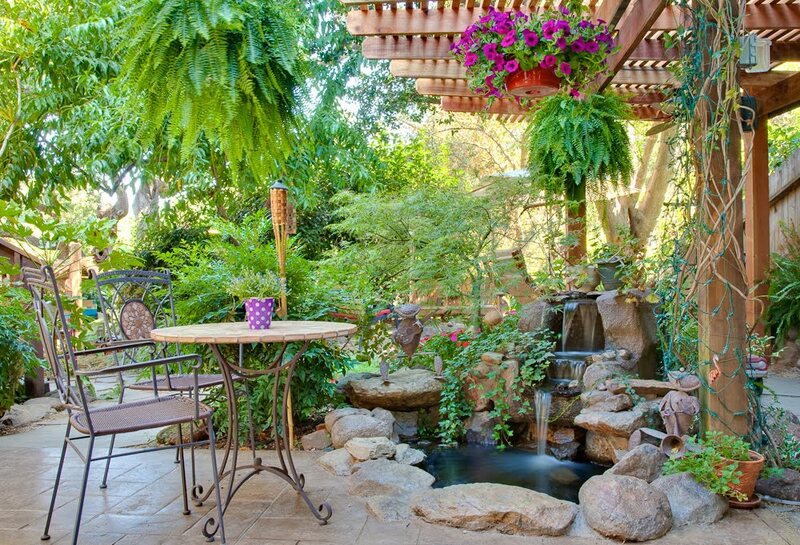 Their yard was professionally photographed recently by Rob Vomond. He has graciously given his permission for me to share a few of his images. 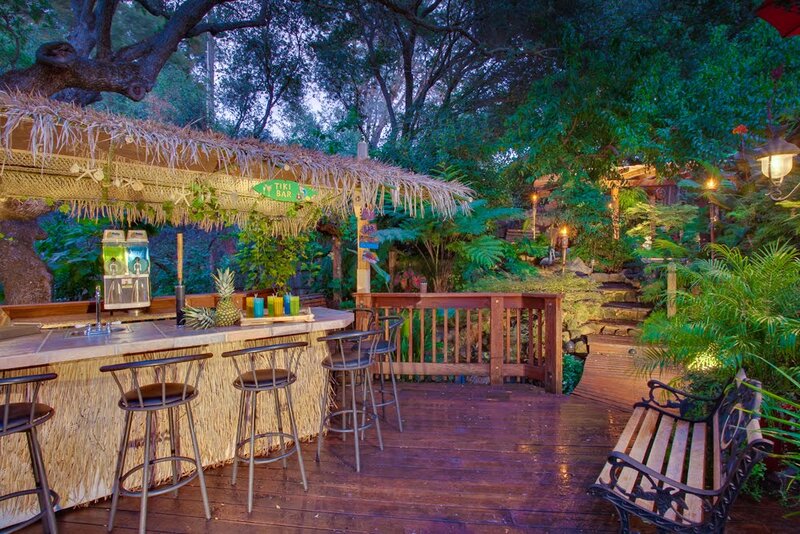 (Above) The beautiful outdoor bar, notice the slushy machine behind the bar! Beautiful yard photos by Rob Vomund. 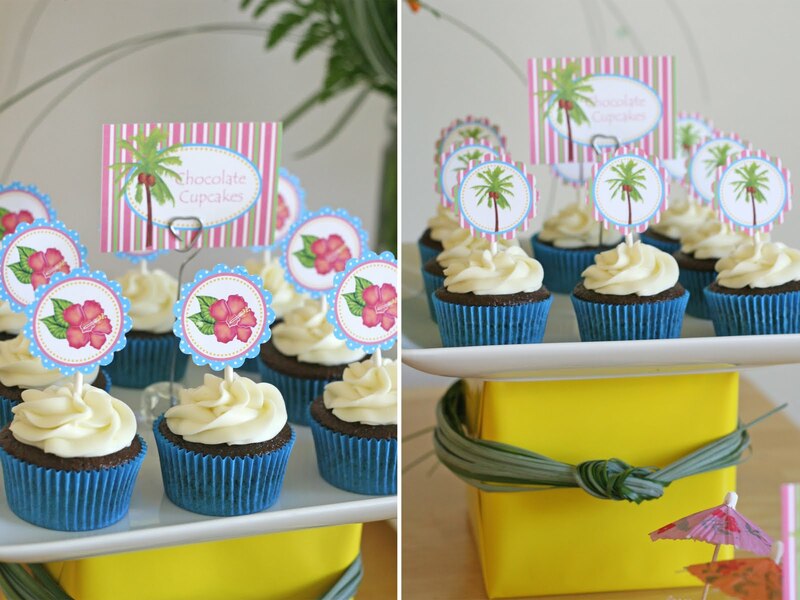 Party printables (food labels and cupacke toppers) by Littlebeane Boutique. 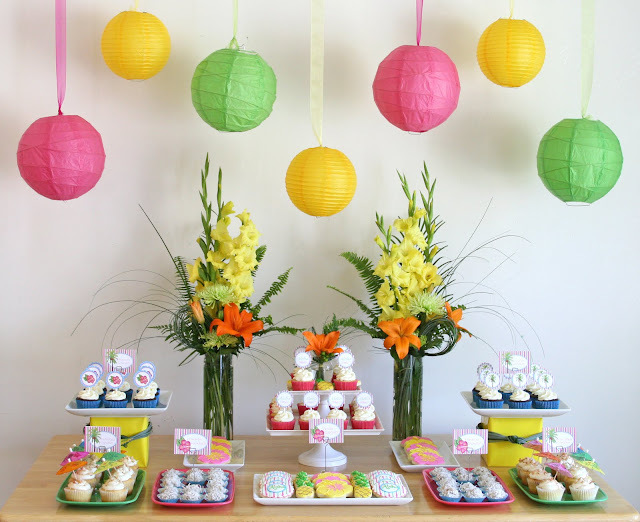 Paper lanterns (hanging above the dessert table) from Luna Bazaar. 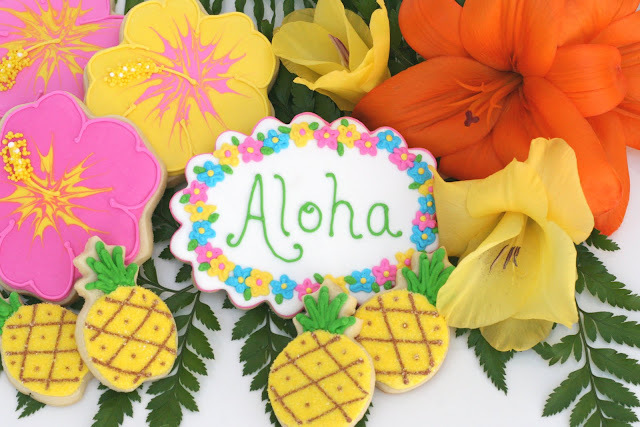 Scallopped “Aloha” cookie at the top of the post was made with a beautiful cookie cutter from Copper Gifts. Looks so beautiful. And what delicious food. wow the treats and set up were gorgeous, the location unreal! what a fun batch of photos to enjoy. thanks for sharing!! Such gorgeous photos!! LOVE those cookies in the shape of Hibiscus Flowers! Absolutely delightful. Do you cater?? Would you consider getting paid for some of your treats?? I'm hosting a ladybug themed party in April (yes I'm planning now..ha) and I'd love to pay you to perhaps make some treats for our party! epkilmer@gmail.com is where I can be reached. I always love your cookies, but those flowers….are….unbelievable!!!! I love them!!! Beautiful party. Gorgeous shots Glory!!!!!! and boy did those cupcakes make me crazy that I had to miss it!!!!! WOW, amazing job! Great attention to detail. Beautiful color, love the hibiscus cookie, fab job!! Beautiful! 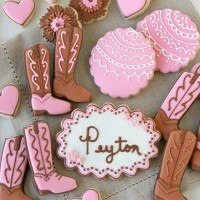 Love it all, but the decorated cookies have to be my favorite! Thank you for mentioning CopperGifts. The whole party looks and sounds amazing!! Fantastic job!! I love those cookie designs. Love all your pictures! Your blog posting is wonderful! All the treats you made were glorious, but the best treat of all is being your friend! You're such an amazing, sweet, wonderful person… We're blessed to have you in our lives. Thank you for helping to make our party a success! The desserts were the icing on the cake! beautiful display!!! Everything looks so yummy!! Wow, everything looks beautiful. The table display, the food, just beautiful. Great job!!! So bright and colorful! You did a fantastic job with the table! And that backyard???? Yeah, I could totally see myself chillin' back there! 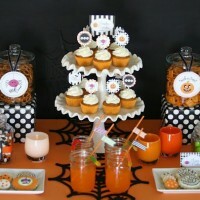 what a lovely setup of dessert table!! Everything matches perfectly right down to the label and location. The desserts look yummy too! Love the yard, love the food. Wish you lived in Oklahoma we could be great friends. You have done an amazing job – a lot of work in those cookies! Oh my gosh, their backyard is amazing. And I love your table display – the flower arrangements are perfect. Your cookies are spectacular! Gorgeous! Beautiful Glory!! I just received your link via facebook from Shelly, we are old high school friends. I've read about her luaus for a few years and always wish I could go too. Your cookies are absolutely amazing! Oh my heavens. What a GORGEOUS table! 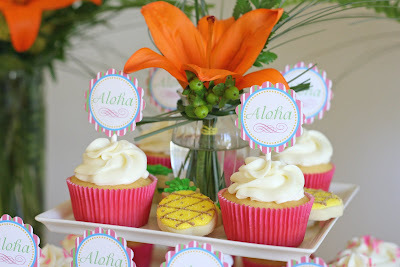 Would you mind if I featured your luau on my blog, Simply Styled Events? Maegan- I'd love you to feature this on your blog, thanks for asking! Please send me a link to the post when you have it up. @D- I have quite a collection of platters and stands!! I buy them anywhere and everywhere! The square cake stands are from the Martha Stewart line at Macy's, the other white platters are from Target, and the colorful platters are plastic, and I found them at Home Goods. This will fabulous, no– you're whole blog of fabulous! I love browsing when I have extra time. You're recipes and decorating are great. 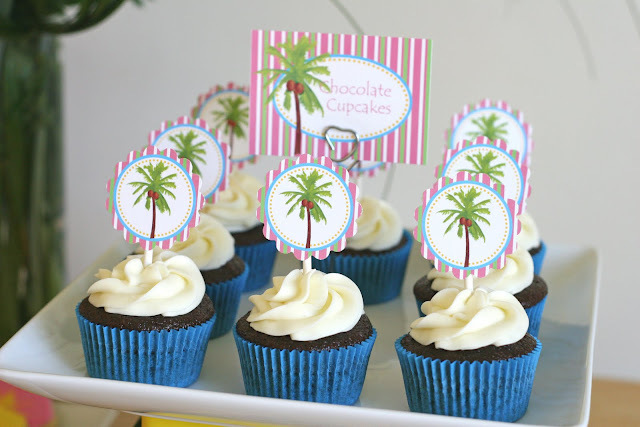 If you remember, I'd love to know how you frosted the chocolate cupcakes with the palm tree toppers in this post. It's like the perfect dollop of frosting! I'm not sure if its a swirl or not but I'd love to know! OH GLORY PLEASE REPLY ASAP! 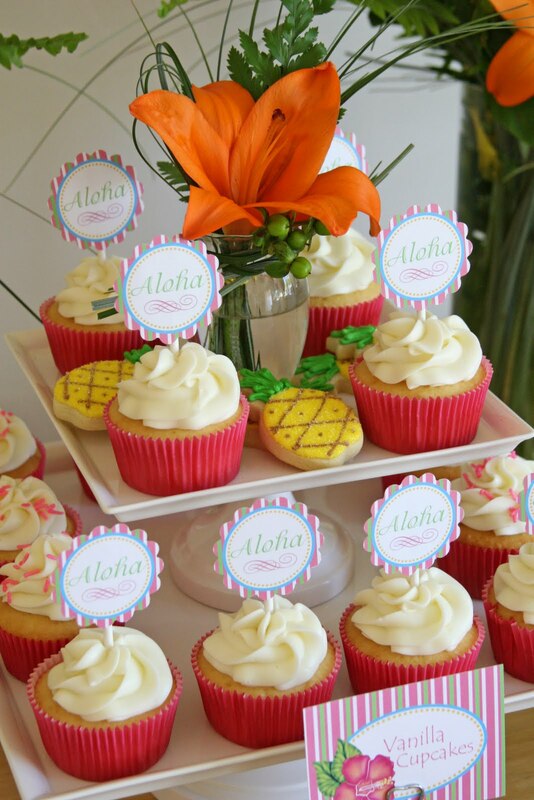 I am hosting a similar Luau Party this week (OMG I KNOW!) and I can't find your post on Hawaiian Snowballs! COuld youu please send me a link or something??? THANK YOU! BTW I <3 your creations and hope to be as talented as you one day! 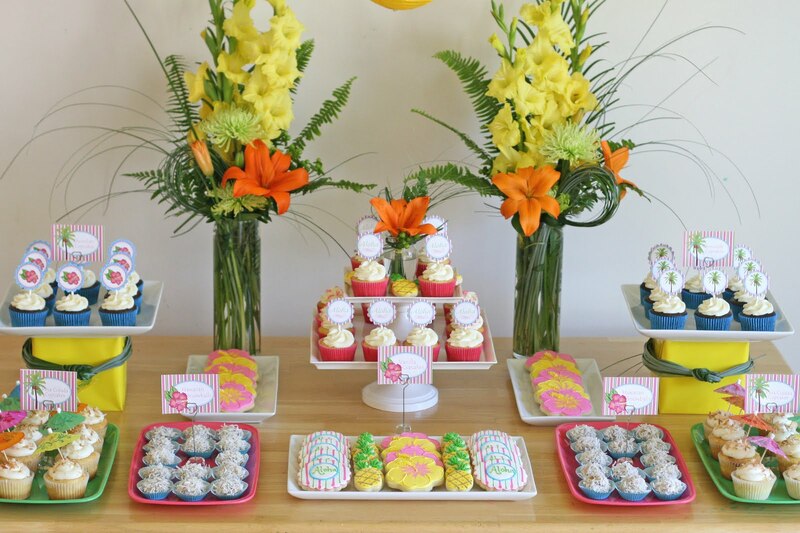 I love the flower cookies and the table with the flowers is wonderful! Amazing and the party sounds fantastic-the setting is amazing! Wow! I have no idea who u guys r bu t u r my Heros! 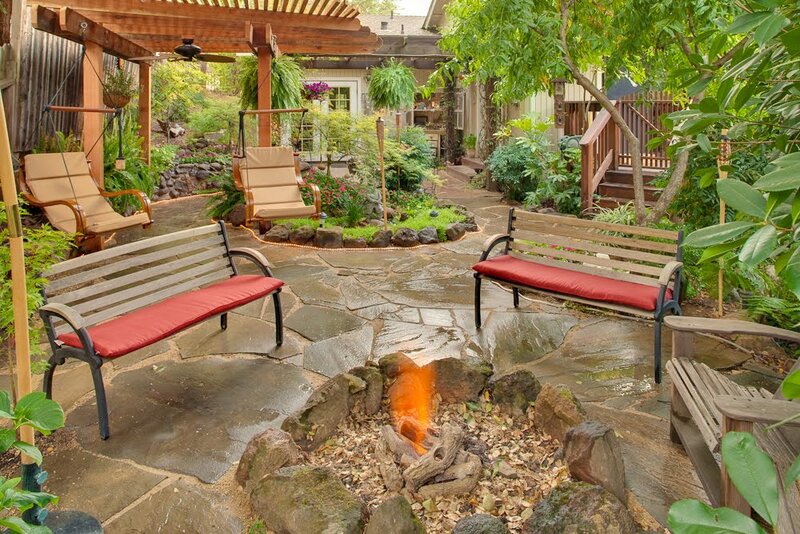 The landscaping is out of this world. Something regular folk like me only see in movies. the desserts are beyond professional. They r so creative and beautiful. The pineapple tree is inspiring. 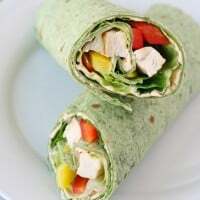 I can’t wait to try to make it. I was looking for an edible tree art centerpiece. I want you to know that I appreciate u sharing it so others cud try to make it. U make this world a sweeter and more fun place!!! !